Home→Uncategorized→More from John and Barbara at the Southern Border! More from John and Barbara at the Southern Border! Below is a 10-18-2018 newsletter from SAVE RGV from LNG. The company’s having financial and organizational problems. Two local communities and three local groups have requested Contested Hearings to keep the Texas Commission for Environmental Quality from giving Rio Grande LNG the air quality permits it needs. We have until 11-19-2018 to submit comments to the US Army Corps of Engineers opposing Rio Grande LNG and its Rio Bravo Pipeline. SAVE RGV from LNG will be holding protests against Rio Grande LNG and the Rio Bravo Pipeline in Kingsville 11-13-2018, in Raymondville 11-14-2018, and in Port Isabel 11-15-2018. We have until 12-03-2018 to make comments against both projects. We need your presence at the hearings next month for Rio Grande LNG and the Rio Bravo Pipeline. The Federal Energy Regulatory Commission (FERC) has scheduled three not-so-public “comment sessions.” The FERC will be collecting comments for their Rio Grande LNG & the Rio Bravo Pipeline Draft Environmental Impact Statement. Their draft was just released for public review on Friday, October 12, and can be read on our website. Save RGV from LNG will post fact sheets about LNG impacts online. The comment sessions are scheduled for November 13th, 14th, & 15th in the cities of Kingsville, Raymondville, and Port Isabel, TX. Stenographers will be present to record verbal comments on an individual basis rather hold a regular public hearing. The FERC staff will be available to answer questions. Please attend the comment session and then join us outside. 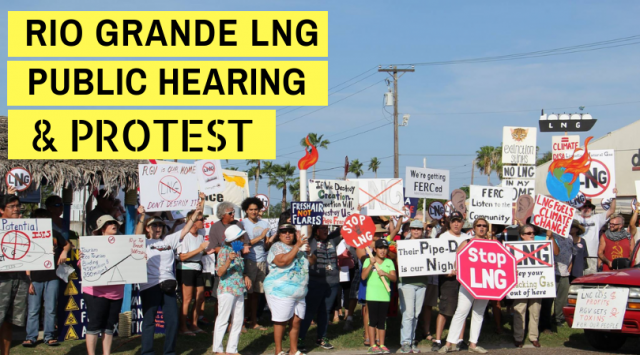 Save RGV from LNG will host a peoples’ public hearing & protest outside the Port Isabel, TX location. Other smaller protests will take place outside the Raymondville and Kingsville sessions. Our concerns and opposition to LNG will be heard in a strong, unified voice! Please see below for more details about the upcoming events. Please attend our bi-meeting to learn more about LNG, receive an update on the status of the LNG projects, and help us plan outreach events. Click here to see the Facebook event. RSVP not required to attend. CineSolar is a solar-powered outdoor screening of short films on environmental & social justice, including a short film about the movement to stop LNG in the RGV. Food is provided and the event is free to the public. There will be two CineSolar events in the RGV. The event locations will be announced RSVP on Facebook to stay updated for the events in McAllen and Brownsville. Please attend the FERC comment session and then join us outside. Save RGV from LNG will host our own public hearing, a press conference, and protest. Click here to see the event on Facebook. Please attend the FERC comment session and then join us outside. Save RGV from LNG will host a peoples’ public hearing & protest. Click here to read the event on Facebook.